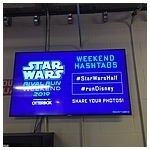 The 2019 Star Wars Rival Run Weekend Presented by OtterBox took place April 4-7 and has officially come and gone. 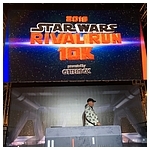 This was the 4th Annual runDisney Star Wars themed event at the Walt Disney World Resort and the first with the Rival Run Weekend theme. 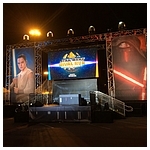 Previously, it was the "Dark Side Weekend" to coincide with the "Light Side Weekend" that originated and took place out in Anaheim, CA at the Disneyland Resort before being cancelled after the 2017 event due to issues with the city. 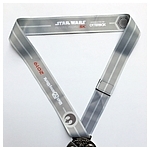 Now, we celebrate classic rivalries from the Star Wars universe which was a fantastic idea and it resulted in some really, really incredible merchandise and medals. If you missed our coverage towards the end of last week, check out the full gallery of exclusive event merchandise right here. 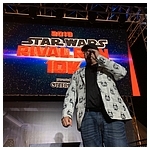 Among the many items available, fans were able to purchase shirts, jackets, hats, socks, headbands, pins, ornaments, glasses, cups, magnets, socks, a VERY cool Luke Skywalker/Darth Vader statue and more! 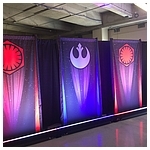 There's really something for everyone and I'll be perfectly honest...I think the merchandise for this event blows away pretty much anything we've seen announced for this week's forthcoming Star Wars Celebration Chicago event. 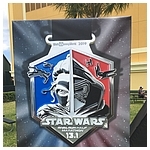 As has been the case each and every year since these Star Wars races began, we had several Rebelscum forum members out there on the course this past weekend. In the cover images, from left to right: Colin Gould, Chris Wyman, Mike De Stefano (Kmsunrise), Gus Lopez (gus), Elling Haug (Dark_Elling) & Michael McLain (thesithcalls). 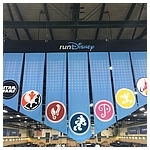 As always, the festivities began with the runDisney Health & Fitness Expo at the ESPN Wide World of Sports Complex on Thursday. 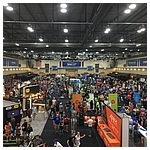 Runners arrived to pick up their race bibs & shirts, browse the official merchandise store and shop the many vendors setup around the exhibit hall. 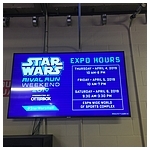 There you could find running gear, get a massage, sign up for future race weekends, taste samples of various healthy snacks, talk to the experts & ask questions, attend seminars and more. 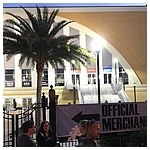 The Expo actually runs for three days, so while many do like to get in early and get their shopping done and obtain their race packets, Friday & Saturday are also an option. 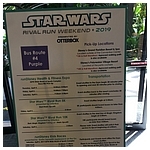 When you first signed up for this event back in 2018, you were given the choice of either running for the Light Side or the Dark Side. 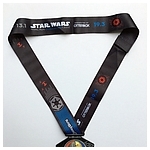 Depending on your choice, your race bib(s) were either Light Side characters or Dark Side characters and they matched the rivalries for each race medal, so that was a nice touch and the first time they've offered something like that for a Star Wars run weekend. 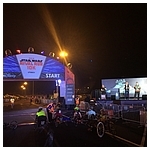 Just as they did in 2018, runDisney offered the 2nd Annual Virtual Star Wars Half Marathon which allowed runners to complete the total distance of a Half Marathon however they wanted to on their own time leading up to the Rival Run Weekend. This also opens the door to complete the Kessel Run Challenge which I'll talk more about below. 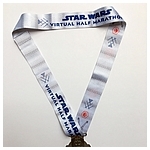 The reward for completing this Virtual run was a beautiful R2-D2 medal that came with a matching pin in the same style. 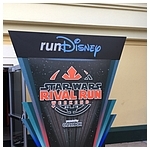 The Star Wars Rival Run 5K is considered a "fun run" and not timed, so runners start at the front and those who choose to walk the 3.1 miles are supposed to start near the back. 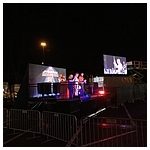 With roughly 15,000 people reportedly registered, the Friday morning race was scheduled for the usual 5:30am start, but for the first time in the entire history of runDisney Star Wars races, there was actually a delay to the start due to weather. I personally run a lot of runDisney events and only once in all these years have I ever experienced a delay due to weather, so it's a super rare occurrence. Unfortunately, everyone had to seek cover for about two hours that morning to wait out a major rain storm that saw lightning dancing across the sky. What this created was a lot of tired and weary participants left to wonder if the race would be called or if we would get to continue. 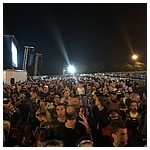 Around 7:30am, we were finally ready to start and some had made their way back to the starting corrals, but some had already left and gone back to their hotels or homes resulting in many having to rush back to the starting area from much further away than the parking lot. The rain continued, although much lighter than it had been falling. 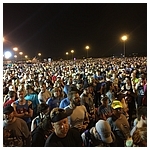 There were hundreds and hundreds of people that had made their away across the parking lot to seek shelter in the large buses staged to take everyone back to their hotels after the race concluded. Much to the horror of those of us that started at the front and planned to run the entire race, when we made our way around the bend to where the buses were parked, all of these people were told to deboard and walked onto the course to start the race completely skipping a good portion of their 5K which created a solid wall and a near standstill for those of us actually running. It's unclear why everyone was told to do this, but it certainly made for a very dangerous and disappointing morning as everyone had to zig and zag through a giant mess of puddles and people. I think everyone was glad to be done with this one after it was over. 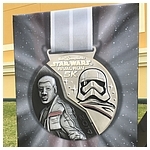 The first medal of the weekend featured Finn vs. Captain Phasma. Saturday morning arrived and the rain did not. 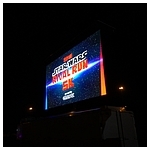 It was warm, but there would be no delays for the start of the Star Wars Rival Run 10K. As a runner, the goal is always to do better than you've done previously, so with that mindset and with some serious training behind me, I planned to push this one pretty hard. All that training paid off as I set a new personal record for an officially timed 10K and had a blast finishing the 6.2 mile course. runDisney does a fantastic job putting fun characters & photo ops along the course. Unfortunately, for anyone reading this review, my phone is strapped to my arm and I do not stop for photo ops, so I have no photos of any characters to share that appeared on the course. Some of the characters that were available included an Ewok, Rey, Sabine & Ezra & First Order Stormtroopers. 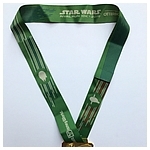 The race was complete and an extremely nice medal featuring Han Solo & Boba Fett was collected at the finish. 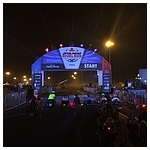 A total of 11,545 people completed the race. 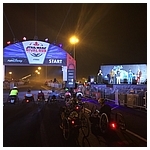 The runDisney Kids Dashes also took place on Saturday later in the morning which included a 100-Meter Dash, a 200-Meter Dash, a Diaper Dash and a 1-mile run. It poured overnight, but early Sunday morning the skies were clear and the Florida humidity was in full swing. 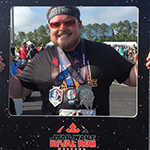 The Star Wars Rival Run Half Marathon is the highlight of the entire weekend and of course, the longest distance to complete at 13.1 miles. 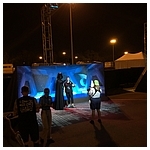 On the way to the starting corrals, runners could get photos with Darth Vader, Jabba the Hutt, BB-8, an Ewok & Tusken Raiders. Once again, I found myself balancing the intense heat with the fact that I'd been training to get a great finish time, so I decided to push it for as long a I could and it really, really worked out well as I ended up setting a new personal record for a timed Half Marathon distance too. 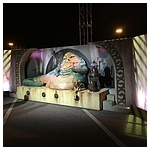 There were even more characters on the course for this longer event that included Chewbacca, Darth Maul, the Trash Compactor scene and the Wampa ice cave. 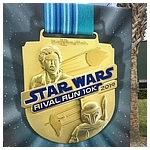 At the finish, K-2SO, Darth Vader, Kylo Ren, Jabba the Hutt, Boba Fett, BB-8 and others were available for more photos. 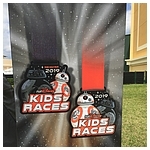 For completion of this race, runners were given a wonderfully designed Rey vs. Kylo Ren medal. 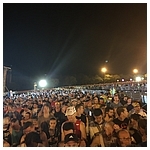 A total of 12,113 people completed the race. 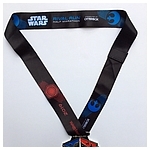 For those that chose to run the Star Wars Rival Run Challenge which consisted of both the 10K & Half Marathon, a special Luke Skywalker vs. Darth Vader spinner medal was given in addition to the standard race medals. 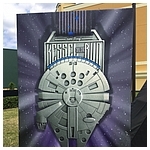 For those that signed up for the Kessel Run Challenge which consisted of running both the Star Wars Virtual Half Marathon & the Star Wars Rival Run Challenge, the coveted Kessel Run Challenge medal was given which, for the fourth year in a row and as one would expect, was a heavy and large Millennium Falcon. 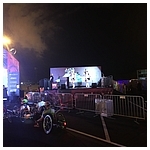 Overall, it was another great runDisney event at the Walt Disney World Resort and I can't wait for the next one. 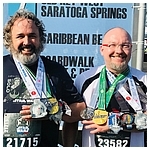 If you like what you've read & seen here and you're interested in a future event, please consider signing up for one or more of these races and join us out on the course! 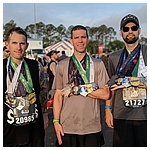 Not everyone will fall in love with running, but it's a great way to spend time with family & friends, get some exercise, collect some cool merchandise & hardware and, you get to run through some of Disney's theme parks which is always exciting. The next runDisney event is actually the Disneyland Paris Run Weekend taking place September 19-22 at Disneyland Paris. This will be my third year in a row doing that and it's a pretty amazing experience. 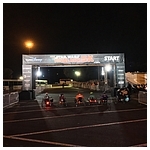 After that, the Disney Wine & Dine Half Marathon Weekend taking place October 31 - November 3rd at the Walt Disney World Resort rounds out the runDisney events for 2019 and there are still spots open for both the Half Marathon and the Challenge (10K & Half Marathon). 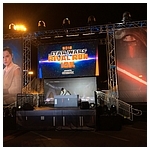 For next year, there's some debate whether Disney will plot a course through the much anticipated Star Wars: Galaxy's Edge opening at Disney's Hollywood Studios later this year for the 2020 Star Wars Rival Run Weekend. Of course, that would only make sense to run through the Black Spire Outpost since it will have been open for many months by then. 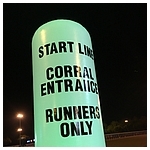 runDisney doesn't reveal the courses for race weekends very far in advance, so we'll just have to wait and see. 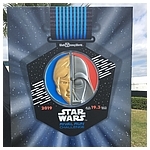 One other thing to keep in mind...the 2020 event will be the 5th Anniversary for the Star Wars race weekend in Orlando which means anyone that has run the Half Marathon since the inaugural event in 2016 will become what they refer to as a Legacy runner. 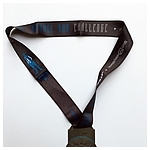 With that comes some additional perks including a different race bib than the standard one given to runners, alternate lanyards for your medal and sometimes, you're even recognized in the event guide. Good luck with your training and may the Force be with you!